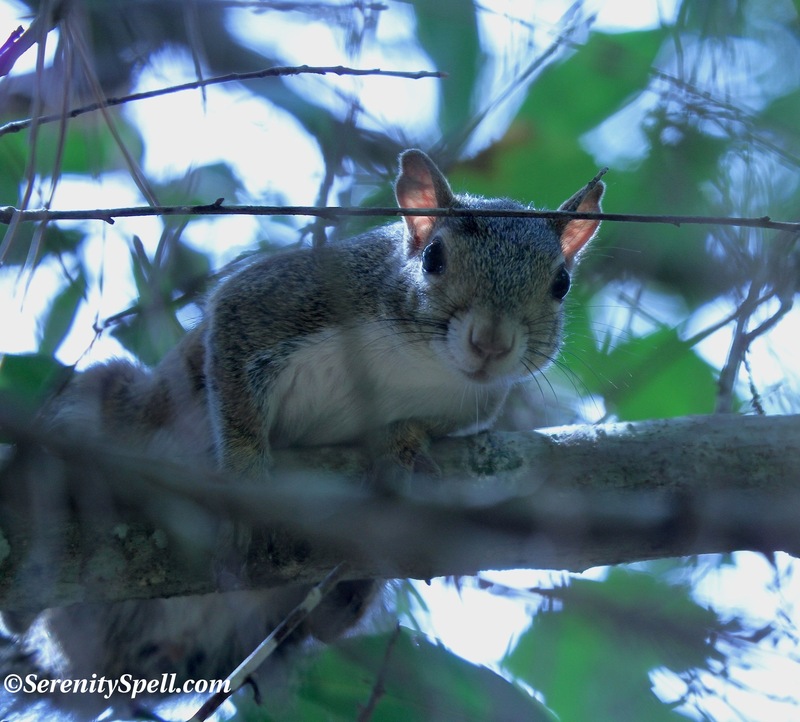 On a walk through some wonderful Florida woods recently, we were visited by an exceptionally personable squirrel — even after realizing we had no food to offer, his quirky and friendly presence captivated us for quite some time. I thought he was a nice beginning to a short week — so happy and relaxed in his beautiful trees — and sure to bring a smile. Done with you, human. Time for my nap! 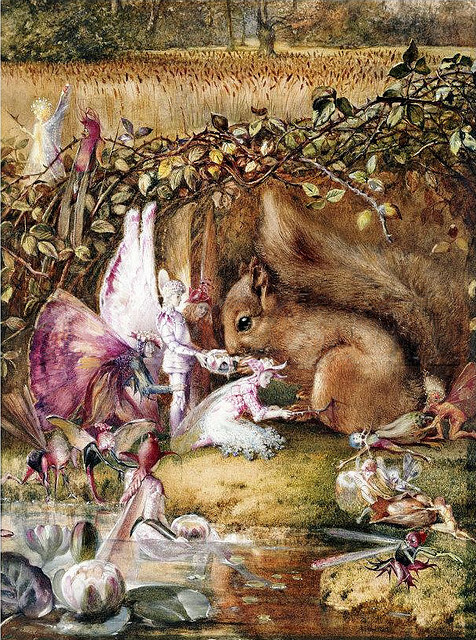 And in honor of this most adorable and friendly critter: Fairies tending to their squirrel! Thanks for the post. Once – now , oh so many years ago my niece rescued a baby squirrel. She, of course, expected that this little wild thing would become a pet forever but a life would have it, needless to say this was not so. We named him Kalakoldhik (this is Russian for “bell”) . Because he was not really accustomed to the indoors (who can blame him??) he made a hole in our shed door for him to come in and out freely. He would come when we called him to feed him peanuts and, of course , we gave him other food to round off his diet. Of course, the road to complete wildness was not smooth but we tried to keep him safe and when one huge squirrel tried to harm him, we captured this hugey and took him to a park far from our home. Kalagolchick stayed with us, in our shed, for two years and then he got married and had his own family. You may ask how we know – well first of all we saw the “woman” with whom he fell in love (unlike he who was completely black, she was a beautiful brown-grey squirrel with a huge bushy tail. Who wouldn’t fall for her???) and later when the little ones were already a bit bigger he brought them around to show us. Again, how did we know it was he – because he had a visible scar on one side of his nose from the fall from mama’s nest once so long ago!!! Adorable and curious – what a cool little squirrel. Once years ago, when I was attending the University of Texas in Austin, I had a close encounter with the gutsiest squirrel I’ve met yet. I was sitting on a concrete bench under an oak tree at the edge of a grassy quad between buildings, munching a peanutbutter sandwich and reading a book in my lap. Gutsy squirrel landed on my back, climbed onto my shoulder and reached for my sandwich before I could gasp or scream (which I did a moment later because he startled the snot out of me). So gutsy squirrel jumped to the ground then turned around and chattered at me. I stared at him. He chattered some more. So I shared the rest of my sandwich with him – a bite for me, a bit for him. I figured nerve like that ought to be rewarded (and living where he did, it probably was rewarded quite a bit. A lot of people had their lunch in that quad). He was a cool little guy, huh? And… GASP!!! Your story is identical to one of mine! When I lived in Seattle, I worked as a Teacher’s Aide (read: poor! poor!). I would walk to the Seattle Center during my lunch hour, and eat my daily PB&J. It was a nice, relaxing lunch in that area, sitting on the lawn under the trees. EVERY DAY, without fail, I had the same squirrel scurry up to my lap for nibbles of my PB. I eventually added tons of PB to the sandwich. Soon enough, he was sitting on my lap, hee. That’s sooo funny!! Mine didn’t jump me though. That would have scared the @#(@ outta me. 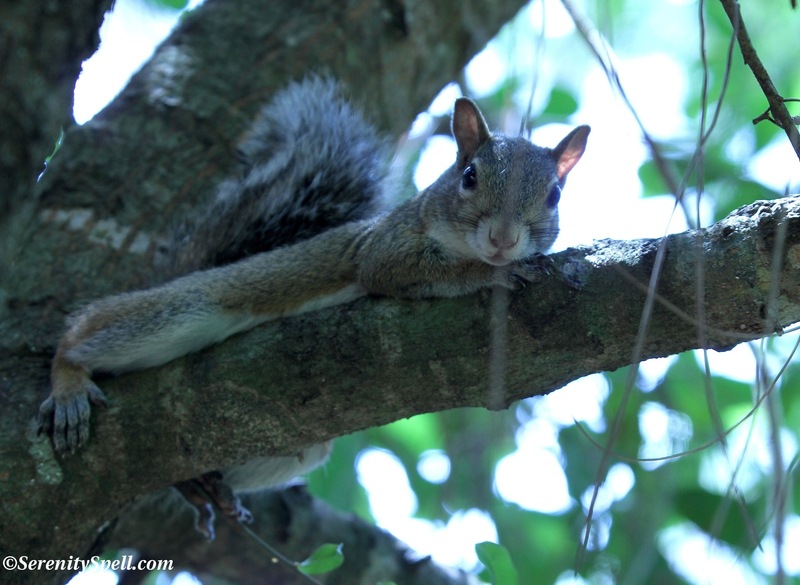 There are always squirrels around our home – they love unsalted peanuts! I enjoy them even if they do occasionally bite a hole in the porch screen. I’ve never seen the fairies and squirrel picture – how sweet! I adore these older fairytale artists… They had such a beautiful and natural sensibility that we seem to be missing today in art. What a wonderful creature. 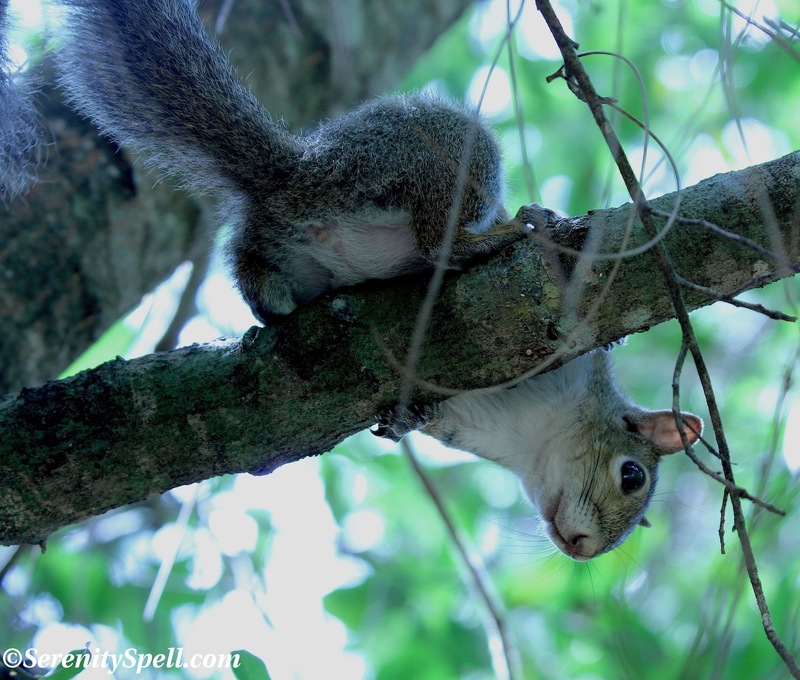 I love squirrels, but I saw them a lot more often when I lived in the woods before. miss them, love yours. Ah, thanks so much! I’m sorry you don’t get to see them as much anymore… They’re such adorable little critters — and always so personable! wow wow wow,, this post is soooo nice, funny, and beautiful. 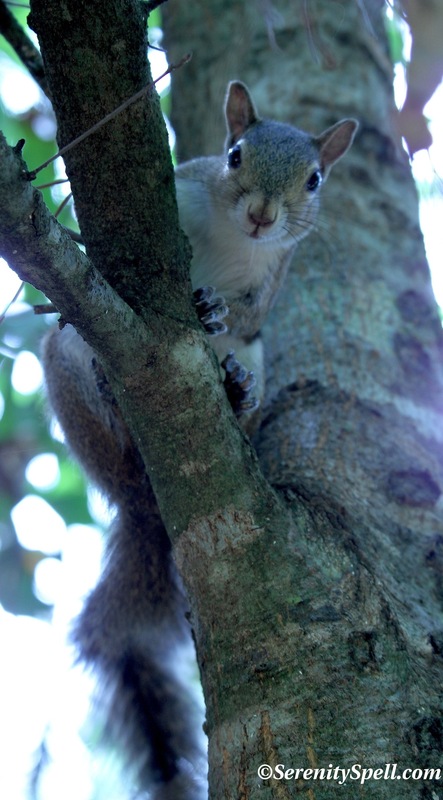 you photograph the squirrel by tha camera and also your funny words…. thank YOU for sharing this. Awwww look at those curious faces! They liked you, Feygirl 🙂 dang! i could tip the like button only once. i’ll just say it then, i love it!! Hahahah!! I love it! Totally a compliment. Look how adorable they are!! I especially like the last one where he’s all stretched out! Cute. :)! He was ready for his nap… Right afterwards, he had his little head down, conked out. Just adorable! Just joined to receive your posts. We are traveling all over the Country- right now in Massachusetts Our dog, Shadow loves the squirrels but where we stayed in the Adirondacks, they were knocking chestnuts down on the RV and scared her to death. Your photos are so natural Fey, love them :-). I cannot resist either to imagine what animals are thinking. We have little chipmunks who come to visit by the patio door every morning…I just love them all! Ah, I wish we had chipmunks! I looove them, but we don’t have them here. I would feed them like mad, hee!! Thanks so much!! He was such a sweet, personable little fellow. What a fantastic quote – love it and it made me smile. That squirrel is too cute! Cute little guy… obviously curious. I think its a squirrel trait. We have dozens on our property. A bumper crop of acorns should keep them happy. Maybe they will stay away from our bird feeder. (grin) I like it when they scold and stamp their little feet on a tree limb. Haaa! I love seeing them try to get at the birdfeeders, too — it’s an ART! Loved the squirrel and his spunky attitude. He was such a friendly fellow, despite the fact that we had no food to offer… And when he was done with us — naptime! WOW! I’ve never heard this about the Native Americans… The link to fairies, I mean. I have so many books on fairies, their histories, myths, legends — and have never stumbled across this. What’s the name of the book, I’d love to check it out!! 🙂 Thanks SO much for this fascinating little bit! LOVE IT! Well the book doesn’t call the “Little People” fairies, but that’s what the description made me think of… especially since the Celtic people also referred to them as “Little People”. The book is by William F. Romain and titled, “Shamans of the Lost World: A Cognitive Approach to the Prehistoric Religion of the Ohio Hopewell.” The Little People are described on p. 49. I got the book because we have so many Hopewell artifacts and earthworks, and I wanted to learn (1) how we have any idea what their worldview was given that they were a prehistoric people, and (2) what did they believe so I can have a better understanding of the meaning of theses archeological treasures? One way that anthropologists try to recover the belief system of the ancient Hopewell (whose culture ended around 400 to 500 A.D.) is to look at Native American belief systems that were still extant when settlers arrived in the area. The more dispersed a belief system was, the greater confidence anthropologists have in projecting that belief system back into antiquity. Anyway that’s why the book was mentioning some of the beliefs of the relatively modern Cherokee and Creek people. As to the Celtic fairies, your post reminded me of a book that I had been wanting to read from some time. I just downloaded it from Gutenberg.org (http://www.gutenberg.org/ebooks/34853): The Fairy-Faith in Celtic Countries. What really struck me as being fascinating is that this scholar went around visiting Celtic people all over Europe (not only Ireland and the British Isles, but other European Celtic strongholds, such as Gallicia in Spain) at the beginning of the 20th century and interviewed people who claimed to have met fairies themselves. Should be an interesting read. Just fascinating… I LOVE what you’re doing with the research! Of course looking at the belief systems helps one understand these ancient peoples. I can’t wait to see what you learn! So wonderful. Like you said, they’re definitely not called “fairy,” but they’re of that ilk for sure. Different place, after all. I’ll have to check out Gutenberg for that book — it looks fascinating. There’s a compilation of essays by Peter Narvaez you’d like, called “The Good People” — fairy lore from around the world, very academic in nature. I had to buy an old library copy, however. He was such a character… So friendly, even after realizing we had NO food for him. When he was done with me — naptime. So great.